Production is planned on the Bed, the Carrousel or the Tables. We are just a few clicks away to plan the production on the FloorDesk Calendar. Check for the productions to plan on the right date and drop them on the day you want to produce. Put your cursor on the information bar and have all information in a few words about the filled percentage of the bed, what jobs are planned on the bed, did we plan stock production on that bed, etc… The FloorDesk Calendar can be configured taking into account curing time needed per bed in a view to promised delivery. Colored presentation and warnings will help you to keep the global overview on your planning in time. Drag and drop to make adjustments. Open production details from here in order to further fill up production when the date comes near. Look up on which production dates a particular job will be taken care of. The complete set of production documents and data for the following day of production can be generated with one push on the button. 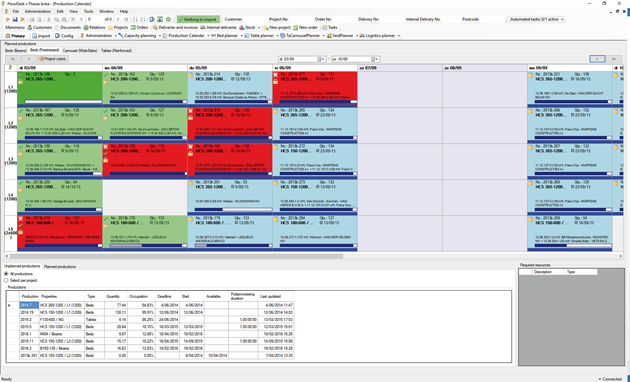 The extension Capacity Planner will allow salespeople to estimate delivery dates based on just knowledge of square meters, or to make reservations on the planning even before the drawing has been detailed in Autofloor.